Back in 2003, we put everything we had in a box, added a huge saving, and called it KOMPLETE: Nine plug-ins, 23 CD-ROMs to hold it all, and the rest is history. Now, for KOMPLETE's 15th anniversary, you can have it all again with the new Collector's Edition - more than 150 instruments, effects, and Expansions, all at an 85% discount. Everything you need for total creative freedom. KOMPLETE 12 ULTIMATE Collector's Edition contains an extensive set of sampled instruments for any scoring project. For the first time ever, get the full SYMPHONY SERIES - COLLECTION as part of KOMPLETE. This complete scoring suite puts a full orchestra and top soloists at your fingertips, with six pro-grade libraries played and recorded by some of the world's top musicians and audio engineers. You also get 10 other movie trailer-ready instruments, from ACTION STRINGS and ACTION STRIKES, to innovative sound design tools like THRILL, KINETIC TOYS, and KINETIC METAL. From faithful hardware recreations, to cutting-edge designs that go beyond the capabilities of even the most out-there analog gear, KOMPLETE 12 ULTIMATE Collector's Edition boasts 16 expressive, versatile synthesizers. Dive into FM synthesis with FM8, discover new textures with FORM, or explore the uncharted sonic worlds of the forthcoming MASSIVE X. Unique to KOMPLETE 12 ULTIMATE are REAKTOR 6-powered favourites like FLESH, RAZOR, and SKANNER XT. If you choose a physical copy of KOMPLETE 12 ULTIMATE, all of your instruments, effects, and additional content comes preloaded onto an HDD. Choose a download version, and your software becomes available right away via Native Access - your one-stop hub for easy product installation, registration, and updates. It's not easy to make sense of over 45,000 sounds. 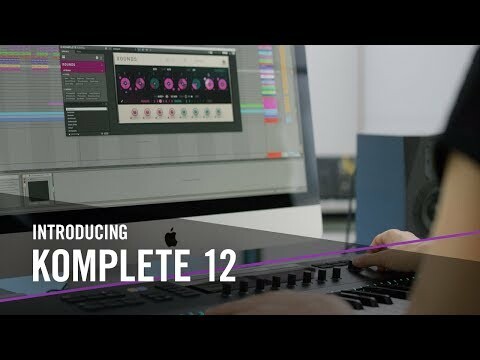 That's why KOMPLETE 12 ULTIMATE comes with KOMPLETE KONTROL - a handy plug-in that makes light work of browsing through all your instruments and effects, whether using NI hardware or your mouse and keyboard. And since each instrument preset comes with an audible preview, you can audition all your sounds without waiting for extra plug-ins to load. Everything in the Collector's Edition comes ready-mapped to your NI hardware by the plug-in developers themselves, so getting hands-on with all your instruments and effects is as simple as connecting a KOMPLETE KONTROL keyboard or MASCHINE controller. And thanks to NKS, you get exactly the same experience with hundreds of plug-ins from more than 75 leading manufacturers. • Runs in 64-bit VST, AU, AAX hosts.